HiMSS Analytics has published a new report offering insight into the real cost of pagers in healthcare. The report quantifies the cost of pagers and highlights the advantages that can be gained from switching to more efficient methods of healthcare communication such as HIPAA-compliant secure messaging apps. Many industries have embraced new communications technology and are now using smartphones to communicate with employees; however, many healthcare organizations are still using outdated pager technology to communicate with physicians and nurses. Pagers have served the healthcare industry well for decades, yet they are inefficient, only allow one-way communication, and can cause communication delays and workflow disruptions. While it is clear that the technology is outdated and needs to be replaced, a great many healthcare providers have been slow to make the move to new channels of communication. This has been attributed, in part, to misconceptions about the value offered by pagers and inaccurate estimates of the actual cost of providing continued pager support. There is no doubt that smartphone secure messaging apps offer a wealth of advantages over the pager. However, what has not been clear until now is how much pagers are actually costing the healthcare industry. Unfortunately, there has been a lack of data on the actual cost of pager use in healthcare. Without a benchmark to show the cost of using pagers, it can be difficult for healthcare decision makers to make informed decisions about retiring pagers and switching to alternative methods of communication. HiMSS Analytics provides market intelligence solutions to the healthcare industry and issues guidance to improve understanding of the latest advances in health IT. Healthcare providers rely on the resources, assessment tools, predictive models, and benchmarks provided by HiMSS Analytics, and use its data when developing market strategies and IT strategic roadmaps. HiMSS Analytics set out to address the knowledge gap and quantify the real cost of the continued use of pagers in healthcare and compare that to new communication technologies such as secure smartphone messaging apps. An in-depth quantitative study was conducted by HiMSS Analytics on more than 200 hospitals in the United States. Those hospitals still extensively use pagers to communicate with physicians and other members of hospital staff. 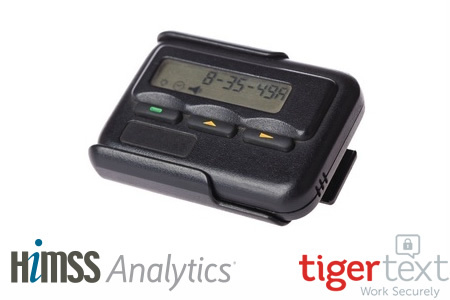 HiMSS Analytics focused on large hospitals with more than 100 patient beds and surveyed healthcare professionals who had a direct role in the purchase and management of pagers. 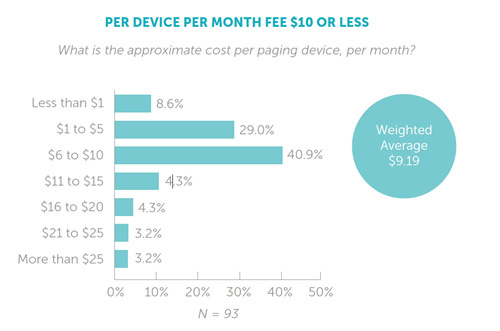 The average cost per paging device per month was calculated to be $9.19. Additional costs of between $50 and $250 were also paid my almost half of respondents. Large organizations were found to be paying over $200,000 per year to support the use of paging services. An analysis conducted by TigerText, the sponsor of the survey, found that on average large organizations that used secure smartphone apps as a replacement for pagers were spending less than $5 per month, per device. Healthcare providers making the switch to pagers stood to make a saving of around $4 per device per month, while also gaining a considerable number of advantages. 20.2% of respondents said they used pagers to contact clinicians remotely; a benefit also offered by smartphone apps. 18.2% of respondents said they used pagers because they saved time, even though physicians were found to have to wait an average of 46 minutes a day for information to be provided over pager networks. 21.3% of organizations said they were using pagers in the belief they were a low cost method of communication, even though pagers were actually costing their organizations more than secure messaging apps. Studies have shown that 96% of physicians use smartphones. Secure smartphone apps allow two-way communication and they can be used to send patient PHI securely. The apps offer delivery and read receipts which eliminate phone tag and unnecessary lost time chasing staff to find out if messages have been received. Many physicians carry a phone in addition to a pager and use their phones to communicate at work. The emergence of HIPAA-compliant, cost-effective alternatives to healthcare pagers has seen many healthcare providers make the decision to retire their pagers and change to more efficient methods of communication. The use of pagers in healthcare has been declining by around 11% per year. Now that the cost advantage of making the switch from pagers to smartphones has been quantified, the report concludes that healthcare providers may be more inclined to make the transition to secure text messaging solutions sooner rather than later. The full report – The Hidden Cost of Pagers in Healthcare – is available here (registration required).